The undebatable statement in the business world is that today’s customer is spoiled. With companies making every conscious attempt to deliver the products & services swiftly, the expectations from the customers are increasing. The customer today wants every information right now. Thanks to the competitiveness of the companies that has resulted in this real challenge. In today’s world where customer experience has to be done from tweet to receipt, the processes have to be accelerated the digitization of processes. Had it would have been automation of existing processes, there wouldn’t have been any debate about it. Companies would have embraced new technologies to go the tech way by now. But the cloud of is all about, Today’s need of the hour is going beyond automating an existing process. To beat the real challenge & with customer and productivity as twin pillars companies must reinvent the entire business process, re-engineer the existing models and cut down the number of steps required. BPM requires digitisation of existing processes combined with new technologies to boost the productivity and efficiency. When the game is all about delighting the customer with a delightful customer experience it is very important that companies optimize the various touch points. Imagine a customer placing the order and the operations manager has to inform the delivery guy about the location where the courier has to be delivered and give him the handful of information and about the preferred time for delivery etc. Let’s suppose after 3-4 hours, the customer has canceled the order and delivery guy is unaware of the cancellation request. Here is when things might get complicated if left unattended. Assume that the operations manager forgets to update the delivery guy, then the customer experience and cost function actually mixes up. This is the case with simple last-mile delivery, such situations crop up in any organization with a workforce. You sit and spend hours trying to find out who is responsible for all the chaos but does it really work? And we are not here to blame or find out where the mistake is rather our focus is on connecting the processes, people and data in making the processes smoother and delivering superior customer experience. Meanwhile, BPM helps in collaboration & integration of people, processes and data. If collaboration across teams, workgroups and departments are set up well, productivity & customer experience won’t go for a toss. For the customer, it is real-time updates & visibility that matters the most. For doing things faster and easier and for running the processes parallel, companies must embark on a robust process engine. With BPM engine, the benefits are huge. It digitizes the data-intensive processes and with this, the TAT is improved by several orders of magnitude. Replacing paper & manual processes with software allows businesses to automatically collect data that can be mined to better understand process performance. By increasing productivity & efficiency along with serving the customer before he expects with the help of BPM companies can improve bottom lines and delightful customers. Customer experience will soon take over price and product as the key brand differentiator. And to deliver remarkable customer experience, supply chain and logistics organizations need to make data-driven decisions on the fly, boost productivity of delivery fleet, ensure 100 percent transparent delivery processes and more. 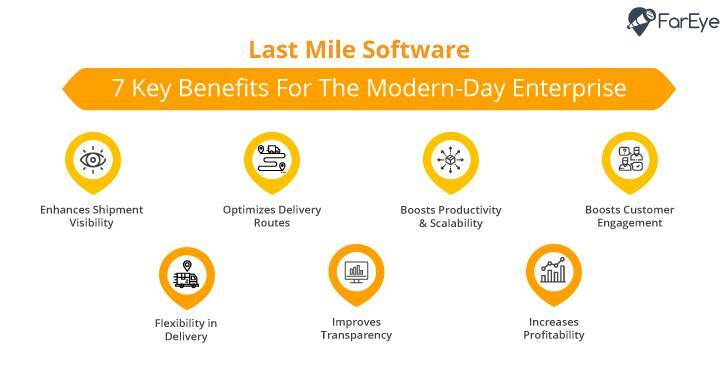 To achieve these goals it’s imperative for businesses a robust last mile delivery software. Here’s why. Storing and securing data is most important for enterprises because it helps in analysing the operations, customer behaviour through better decision making. Also, it helps in storing the data which can be used for later purposes.